Reader Question: Why Is My Cat Losing Hair? My cat has been suffering from hair loss for about six months now. He gets scabs around his neck and hind quarters as well as his feet and back. Under his legs are subjects as well. 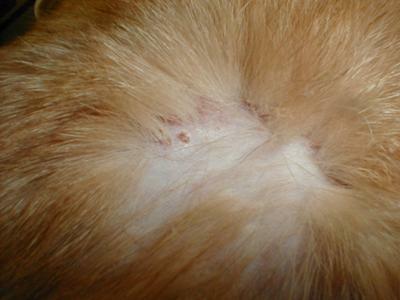 The scabs become larger and then the hair falls out in small tufts. The skin area left behind is pink and clear, but he is uncomfortable. The vet thought he was suffering from an allergy to something he is inhaling but we have removed all air fresheners from the house and he doesn't get better. His diet has been changed three times as has the brands of cat litter. He is getting a depot shot every month which helped at first but has no effect now. I notice that his skin which is unaffected has microscopic black dots that look like dirt. Any ideas? Picture attached, cannot get a good enough picture of the tiny dots as they are too tiny to photograph. Could the “black dots” you mention be flea feces? If you can collect some, put them on a white piece of paper with a small drop of water. If the mixture turns a reddish brown color (from the digested blood in the feces), you have your diagnosis. If your cat were my patient and a flea allergy weren’t to blame, I would next want to run a skin scraping (checking for microscopic mites), a fungal culture to rule out ringworm, and skin cytology to diagnose bacterial or yeast infections. It can take up to three weeks to get the result of a fungal culture, so sometimes we’re put in a position of having to start treatment without a definitive diagnosis. I often prescribe a dose of Revolution to deal with any parasites that can be hard to find on diagnostic tests (as well as fleas) and a medicated shampoo while waiting on the fungal culture results. If all the diagnostic tests come back negative and our initial treatment plan was ineffective, more diagnostic tests (e.g., allergy testing or skin biopsies) might be necessary to accurately diagnose what is going on with your cat. Cat crusty and black "dirt"
It only occurs behind his right ear which he cannot scratch because he has right his arthritis ad cannot reach his ear with his rear paw. I feel sorry for hij and I scratch him and that is when I notice the black crusty pieces and plenty of black "dirt". The problem was never resolved using a natural methodology the only thing that would help him is Depo-Medrol injections approximately every 30 days. He got relief from the injections after we tried everything from diet change to extreme cleaning of his environment including air filtration. None of his issues were to do with any external influences according to the vet (whom we spent a lot of resources on). Regardless of what we did the condition continued. The Depo-Medrol caused a side effect which was diabetes. We now have to give him insulin injections 2x per day. He no longer requires Depo-Medrol as once his diabetes started the fur and skin problem disappeared but his endocrine system is now damaged because of the Depo-Medrol. No one wants an animal to suffer so it's been a difficult journey. He's still with us and such a good fellow.